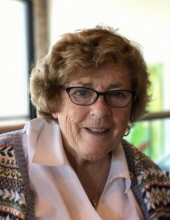 Carolyn Touney, of Port Washington, passed away peacefully in the afternoon hours of Saturday, April 6, 2019 at Sharon S. Richardson Community Hospice in Sheboygan Falls. She was 69 years old. Carrie was born in Milwaukee on July 1, 1949, daughter of Frank Howard and Catherine Hargraves Howard. She grew up in Shorewood and graduated from Dominican High School with the class of 1967. On May 31, 1969 she married Len Touney at St. Robert’s Catholic Church in Shorewood. After Len’s service in the Marine Corps, the couple settled in Port Washington to raise their family. She was a member of St. John XXIII Parish (St. Peter of Alcantara Church) where she was a former member of the Christian Women and the parish council. Carrie was also an active member of the Port Washington Jaycette’s. In her spare time, she enjoyed sewing, golfing, playing games, and driving her lawn tractor. Carrie is survived by her husband Len of Port Washington, her three children: Scott (Tracy) Touney, LtCol, USMC (Ret.) of Appleton, Kevin (Andrea Repphun) Touney of Olympia, WA, and Bridget (Eric) Greiff of Tumwater, WA. She is further survived by seven grandchildren: Eric and Steven Touney, Gwen, Claire and Ian Touney and Cailen and Brennen Greiff, five siblings: Maury (Nila) Howard of Columbus, IN, Frank Howard of Milwaukee, Pat (Peter) Didier of Port Washington, Jackie Shanti of Shorewood and Scott (Maureen) Howard of Spread Eagle, brother-in-law Gene Humphrey of Del Mar, CA, nieces, nephews, other relatives and many, many friends. She is preceded in death by her parents Frank and Catherine Howard, her birth father Thomas Smith, her sister Peg Humphrey and her nephew Joe Didier. A Mass of Christian Burial will be celebrated on Friday, April 12th at 5 PM at St. John XXIII Parish - St. Peter of Alcantara Church, Port Washington. Father Pat Wendt will preside over the Mass. Visitation will take place on Friday the 12th from 1:30 to 4:30 PM at the Eernisse Funeral Home, 1600 W. Grand Ave., Port Washington. In lieu of flowers, memorials are suggested to the Michael J. Fox Foundation for Parkinson’s Research (www.michaeljfox.org) or Sharon S. Richard Community Hospice (www.ssrhospicehome.org). To send flowers or a remembrance gift to the family of Carolyn A. "Carrie" Touney, please visit our Tribute Store. "Email Address" would like to share the life celebration of Carolyn A. "Carrie" Touney. Click on the "link" to go to share a favorite memory or leave a condolence message for the family.